Neil Margetts gives us further details on the event along with the comp topo! There is one month to go before the start of the Easter Bouldering Festival. There has been a lot of interest by boulderers of all abilities, hard men and women for the Saturday event, those who are keen to open in the new area and those who are coming to support and watch. This interest is evident in talking to a lot of climbers; the consensus is they want to restore something of what the NBL used to be. The finals done at The Kraal near Swinburne in 2004, Swinburne itself in 2005, Eagles Head in 2006 and 2007 and Redhill in 2008 were enjoyed by all. However rock finals have their problems, plastic is much more precise for selection and where serious IFSC rules can be implemented. Thus to have a outdoor event linked to the indoor event each year covers both and this will justify the long trip and expense if there is more on offer. This year adults can enjoy the difficulty event on the Saturday and then if they want to do the plastic NBL final at City Rock the next day it will give the other average climbers a chance to get some prizes on the opening feast. We have booked a large section of the local campsite. The campsite has all the necessary amenities and is a beautiful spot in a forest overlooking a dam. The venue is 140km away from Cape Town but not in the direction of Rocklands, more to the East, nearer to the N1. If you know where the proposed areas is or have worked it out, please keep in the spirit of the event and do not go there ahead of the time to practice the problems. 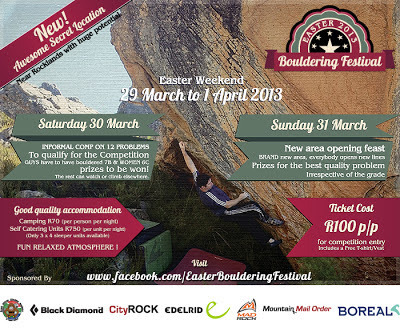 One week before the time, directions will be sent only to those who have indicated they going on the Easter Bouldering Festival Facebook page event, so go to this page and indicate if you wish to go. Please also invite others who you think may be interested. Arrive and settle in. As each person arrives, those who are competing must register and pay the comp fee of R100. This includes a T shirt and other goodies, only the first 35 men and 15 women get a shirt, so if you would like to pre register send Neil an email to info@saclimbingacademy.co.za and he will send you the necessary stuff. Everybody must also pay the full camping fee direct at the campsite office on the day; fee is R70 per adult per night, and R40 per child per night. 4pm: Late afternoon tour of the comp area for those who want to view the problems, not compulsory. You will only be able to view the problems from the path. (see topo). 7pm: Compulsory briefing and talk/discussion on the environmental impact of bouldering. We meet at car park at 7:45 to start at 8:00. Those who attended the viewing the previous day (thus know where the paths/climbs are and know the general rules) may start later if they wish. Climb the whole day and enjoy one self, others can watch or climb elsewhere only in the other areas designated for the purpose. Remember to not damage the environment, keep hydrated and be safe. All score sheets must be handed to the scorers at the campsite no later than 19:00, late score sheets will not be counted. Prize giving at 20:30 at campsite. Meet again at the car park 7:45 for the opening feast. We will have somebody at the car park at 10:30 to show those who want to sleep in a bit, but they may miss the best lines. You will be led to the area and the opening will start at 8:30 am. Each person will only be allowed to submit 1 to 2 of their best problems (depending on number of competitors). These problems all need to be recorded on a cell phone photo with a brief description. These have to be smsed, blue toothed or sent via Whatsapp with the photos to one of 3 designated receiving phones. All the data will be assembled and linked to a google earth image via tablet at the site. Each line has to be actually climbed, no projects allowed. The idea is to be mature and not fight over who wants to submit what. The lines have to be done and submitted by 18:00. Straight after this the 10 finalists will be selected who will have to show a panel of judges the location of their problem/problems who will decide the final winners. Prize giving at 20:30 as before. Enjoy oneself, play an April fool trick on somebody with a hangover, climb some more and then sadly go home. Feel free to send Neil Margetts an email on info@saclimbingacademy.co.za or whatsapp/sms/phone him on 083 669 3028 if you have any questions. Check out the topo here.